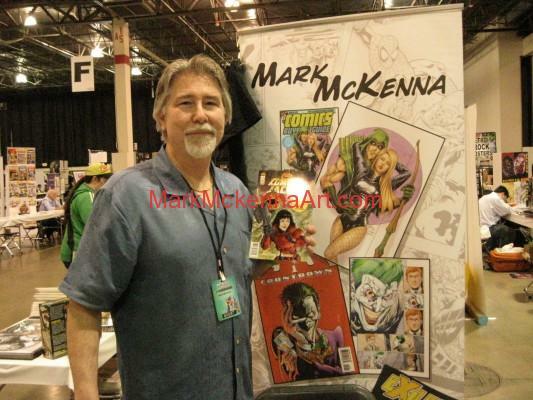 I don’t know if you know this, but I’ve been a comic book artist for 32 years, having worked for both Marvel and DC comics on the likes of The X Men and Spider Man to Batman and The Justice League. There are almost 600 comics that list my name in the credits and 12,000 pages that bear my ink lines on them. His children’s book series Banana Tail and Friends is a labor of love that he created when his daughter was four and had a newborn son. His most recent Banana Tail project, The BOOnana Tail Halloween Special was released for Halloween 2014 and was treated as an “all ages” comic project that continues to grow with children that had the original storybooks read to them as younger children. The other Banana Tail titles include; Banana Tail’s Tales and Activities, Banana Tail’s Colorful Adventure and the soon-to-be-released Banana Tail and the Checkerboard Jungle. Mark has also created, written, inked and published the Sci Fi/Horror COMBAT JACKS comic book mini series. COMBAT JACKS #3… “The Saga Continues” was recently published and is now available under Mark’s Banana Tale Press imprint.